Before I forget, has anyone else had problems posting comments to some of the new bloggers out there? I find it's the ones who have moderation turned on (I think). I'm usually logged into Blogger when I comment - first I type my comment into the box, then I click "Post", then I type in the security numbers and hit enter - and NOTHING happens! My comment just sits there -- goes nowhere -- and doesn't get posted! I've had this happen on at least 6 new bloggers! If anyone knows why this is happening, please let me know! 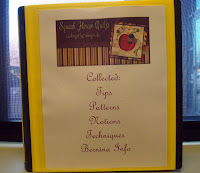 For several years I have kept a notebook of clippings related to quilting, sewing and my Berninas, from magazine articles to blogs to websites. I noticed the other day that it was getting pretty full and really didn't have any character. This is what it looked like this morning. These are the tabs to separate different clippings. This is the front, inside pocket which is stuffed with clipping and printouts I haven't yet inserted into their various tabs. Look who's up front - one of my favorite designers - Monica over at The Happy Zombie! Here is how it looks now after cleaning it out and putting it into a larger, much nicer notebook! I copied the header from my blog page (since most of my clippings are from all the wonderful, creative bloggers I find nowadays), printed it on cardstock, and then typed a few words below it in a fun font called French Script, then inserted it in the cover pocket. On the inside, I found these great, semi-transparent tab dividers. The tabs can be moved into any of the "cuts" you see on the page. I like that you can see through them - helps refresh my memory as to what's in each section. Look - now Monica's Pennie Pockets are resting nicely right up front! The tabs have stick-on labels, but the download for printing on them wasn't working so I hand-wrote on each for now....my handwriting is getting kinda sloppy, though. I'm so happy that all these great ideas now have a "classy" place to hang out! I'm getting closer and closer to that 100th post and another giveaway! 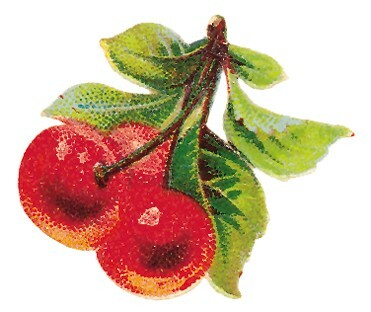 I will probably give you more details in my next post - so as I like to say - stay tuned! You are so organized. Great idea. 100 posts, Wow! I need to be more organized. I do have a photo album with a crazy quilt on the cover with sleeves inside that I put patterns I've torn from magazines. Great idea. I'm having that problem here and there, not just a new places. Weird. Love the folder, very clever. Your just too organized! LOL Bet you'll find whatever your looking for in a snap! Great idea! I'll stay tuned!!! Awesome organization! I need to do the same! I have a tendency to print out and cut out and just put everything in a pile. When it overwhelms me,then I sort them into my binders and such. I should figure out a way to do better. You are so organized! I don't even have my pattern up front on anything! I feel honored to be up front in your binder! Giggle. Giggle. Blush. I'm having blogger posting probs too. I've learned to copy my comment and try again. I can't tell you how many re-types I've had to made.